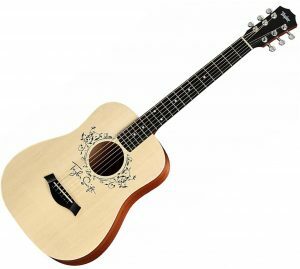 7 Best Beginner Kids Acoustic Guitars Reviewed That Your Child Will Love! 7 Best Beginner Kids Acoustic Guitars That Your Child Will Love! Playing the guitar has many benefits. It helps your child develop memory, self-esteem, attention, creativity and that’s just a tip of the iceberg. With so many bad habits and useless toys out there these days, playing the guitar is such a great hobby for your child to have. As a good parent, you must do whatever it takes to encourage your kid to love music. We reviewed and compared the best kids acoustic guitars to help you choose the one that your child will surely love. 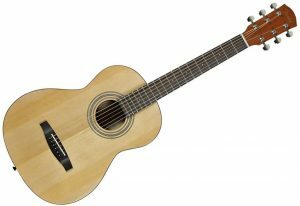 The Hohner 1/2 Sized Classical guitar is 30” in length, has sturdy build quality and is the perfect size for young kids. Featuring nylon strings, that are much easier to play and safe for children. It comes with a songbook and 1 year warranty. The model has accurate intonation and low action which makes it the perfect first instrument for your child. 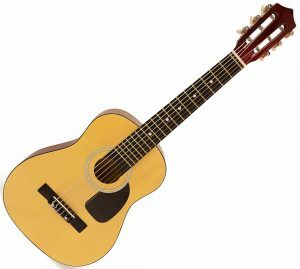 While this is a great instrument for those children that are taking lessons and are somewhat serious about music, I wouldn’t recommend purchasing a classical guitar for a complete beginner. They have a wider necks than regular acoustic models and are not designed to play common chords. Classical models don’t have frets marked up, which is another disadvantage for new learners. There are a few reasons why Luna Aurora Borealis deserves a spot on this list. The first thing that you can probably tell right away – it looks awesome. Don’t get me wrong here. Obviously he look isn’t the primary factor when picking a guitar, but for children it actually is kind of a big deal. The frets marked with Luna’s signature moon phase marks which makes it truly unique. The 3/4 size makes the model a great choice not only for children, but also for anyone with small hands (this is my personal favorite feature since my hands are tiny). Overall, Aurora Borealis has everything a child guitar should have. 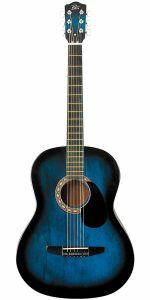 The Rogue starter acoustic guitar is an extremely affordable first guitar for children, featuring a 7/8 scale and petite body design. It comes in six different vibrant colors i.e. Blue burst, Red burst, Pink ,Brown, Black and Matte natural. The model is an amazing deal for a starter, small-bodied guitar. Its smaller profile (7/8″ scale) makes it playable for kids or any aspiring guitarists with smaller body frames and hands. It has a maple neck, rosewood fretboard and Martin strings providing nice tone. Even though I’ve included this guitar on the list, there are some things that I didn’t like about it. First of all, the action may be too high, which is not exactly good. To be fair, the model does have an adjustable truss rode so you can lower the action, but still it doesn’t change the fact that you may need to do some work. Other than that, Martin strings can be quite hard to play, specially for young fingers. Bottom line: I do recommend this guitar for your kid if you know how to change guitar strings and use truss rod to adjust action. This is a great choice if you are on low budget. 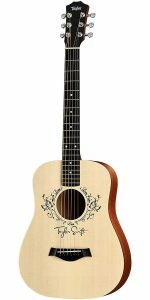 Slightly expensive, the Baby Taylor acoustic is a 3/4 scale model that is easily portable and is easy to play. This guitar was the favorite model of the international pop-start Taylor swift when she went on tours in the earlier days of her career. Why is it good for a child? First of all, it has just the right size: not too big and not too small. Secondly, it has provides great quality. It is more expensive than the previous models, but that’s not the case when you are paying just for the brand or name on it: you are actually getting a high quality instrument that your kid is going to love (a bonus if he or she is a fan of Taylor Swift). Bottom line: highly recommended as the first acoustic guitar for a child. The excellent Yamaha craftsmanship with the use of selected woods for the build of this instrument creates a compact model which gives an authentic acoustic sound. It is the perfect beginner’s guitar in a petite body size. This instrument has amazing sound quality and an outstanding design that is the signature of Yamaha. It comes in a 3/4 size, with a design based on the FG series that makes the mini steel string JR1 one of the top best selling guitars. As most smaller models, it has a hard time staying in tune for too long. It’s not necessarily a bad thing because even the most expensive guitars do go out of tune and you need to tune them every once in a while. The difference is that might need to do it a little more often. Another particular reason why I often recommend 3/4 size models for children is because it has less fretboard space and it’s easier to switch between chords. Bottom line: Yamaha JR1 Junior is definitely recommended as a guitar for your kid. This guitar is fairly costly, at around $150 with a shorter string scale length and smaller sized body suitable for children. The “C” shaped neck provide a sturdy grip, and it only weighs 7.5 pounds, making it easy to hold and carry. The perfect travel instrument with a steel string sound for your child to take on trips. This mahogany pattern high pressure laminate (HPL) comes in a petite size and small scale but holds many features. It is made of Rust Stratabond neck and an East Indian Rosewood fingerboard which helps the Martin sound perfectly tuned and make it travel friendly. It comes with a padded gig-bag and chrome small-knob tuners. Despite being pricey, this model does deserve to be included to the list. The guitar provides high quality construction and components. You pay more, but you get a long-lasting, high-quality instrument. 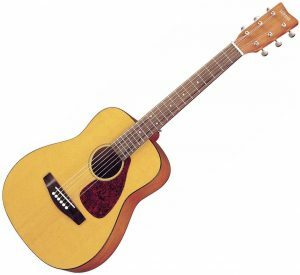 If your child is interested in playing the guitar, then you should definitely pick Martin LX1. However, if you are not sure if your kid will continue playing the guitar, then you can choose a cheaper model (I suggest Yamaha JR1 Junior). Keep in mind that the guitar doesn’t have have frets marked up. It’s not a deal breaker, but I think you should at least pay attention to it in case you decide to buy this model. While there are many things that should be considered when buying your kid a guitar, there is something really important that is actually helpful for you. Let me tell you a short story that happened to me recently. A couple of month ago my 10 years old nephew came over my house and saw my full size dreadnought acoustic model. He tried playing it and it seemed like he loved it. So I said: “Hey, you know what, if you like playing this guitar then you can have it. It’s my gift to you”. So he took it home. However, a week later his parents brought it back to me begging me to take it back. Hearing someone practice a guitar is not fun at all. Specially it concerns little children, who may treat playing it more as a fun game than a routine practice. Even if your child is taking lessons and is somewhat good at it, you still shouldn’t buy a loud guitar. Practicing is all about making mistakes, and hearing that consistently will eventually play on your nerves and cause you headaches. Don’t get me wrong here, I’m not here to question your kid’s musical abilities. Everything said above comes from my own experience and I’m trying to warn you on what you should expect from buying your child a guitar. With that being said, what is a loud one that you should avoid? With electric models it’s pretty simple. Unplugged electric guitars sounds very quiet. Plugged electric guitar’s volume is regulated by the amp volume. Since the sound of an acoustic instruement is produced by air vibrations amplified by the hollow body, the volume of an acoustic guitar is determined by the size of it’s body. The bigger the body is – the louder it sounds. With that being said, I recommend avoiding full size models. Your best options are 3/4 or 1/2 size guitars. The smallest acoustic guitar out there is ukulele, but I do not recommend buying one, because it’s tuned differently from a regular model. A ukulele is not a good option for a beginner player. This depends on how serious your kid is about playing the instrument. If he or she is already taking guitar lessons and already has some interest in the instrument, then you can totally buy an electric guitar. If your kid has never played guitar before and you want to encourage him or her to play it, then I highly recommend getting an acoustic guitar. A guitar should be easily accessible. To play an electric guitar, first you need to plug the amp, then plug the guitar, regulate volume etc. This is an additional obstacle that you don’t want your kid to have. Besides, do you really want your child to deal with plugs and wires? Of course, no. That’s too complicated for the child to do and may be not safe. On the other hand, an acoustic guitar is always accessible and all you need to do is grab it and play. This easy access to the instrument will allow your child to play it anytime. 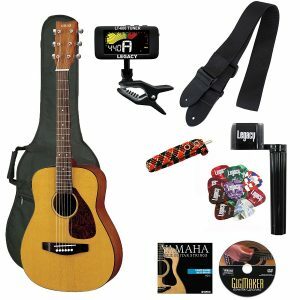 There is no need to deal with wires, chords, plugs or even a pick to play acoustic guitar. 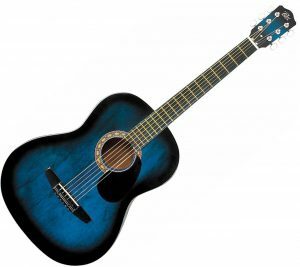 So, if you are not sure whether you should buy an acoustic or electric model for your child, I recommend an acoustic one. Before buying a guitar, something you should really know is your child’s musical style/genre preferences (if he or she already has such). 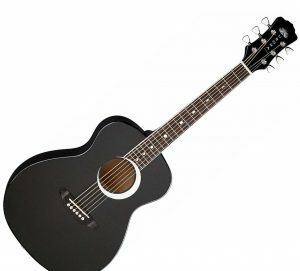 If your kid is a fan of Metallica or metal music in general, then you want to buy a guitar that is appropriate to that style – which is probably a v-shape metal-looking electric guitar. On the other hand, if your child is more into blues – then you probably want to buy Gibson Les Paul or an acoustic one. If your child loves Taylor Swift – buy him or her Taylor Swift signature gift! Imagine how excited will your child be about such a gift! What Price Should You Pay For A Child Guitar? Usually I don’t recommend spending too much money on a guitar because realistically you can get a decent model in a fairly low price range. However, that’s not the case when it comes to buying an instrument for your child. My recommendation is not to cheap out. These days parents spend so much money on toys that are actually bad for their children. They buy expensive tablets or smartphones just so their children can play games all day long instead of doing their homework or hanging out with friends outside. They spend thousands of dollars on gaming computers and then their children spend all the time home playing video games. Playing guitar (and music in general) is so much better and healthier of a hobby for a child to have these days. I do believe that a good parent must do everything he or she can to raise interest to music in their child. Whether it takes to pay a few hundred extra dollars for a good guitar or pay for local lessons – don’t hesitate and absolutely go for it. In a long run you will not regret. Playing a guitar has so many benefits that are actually important for growing children. And what do those $500 smartphones or tablets do for children? Teach them how to be dumb? How to become less social? How to get worse grades at school? I hope you agree with me that if you encourage your kid to play the guitar and it becomes his or her hobby – then you should consider yourself a happy parent. I highly recommend not to cheap out on a guitar for your child. What To Look Out For As A Parent When Buying An Acoustic Instrument For Your Kid? Playing guitar does have some drawbacks that you, as a parent, must be aware of. The root of the problems is the wrong way that many guitarists use to hold the instrument. Prolong playing in a wrong position may cause problems with posture as well as pain in neck, shoulders and wrist. This is another reason why I recommend buying a smaller acoustic model. First of all, acoustic models are much lighter than electric ones due to a hollow body. This will significantly reduce the pressure on the back and shoulders of your kid. Secondly, with a smaller model there is no need to raise the arm too high to hold a guitar, which will reduce the pressure on shoulders and will overall make holding the instrument more comfortable. Keep in mind that even a smaller acoustic model doesn’t guarantee that your child will hold the guitar correctly without impacting the posture. It is hard to advise something specific in this case since every child needs a personal approach. I recommend watching this video to get a better understanding of how anyone should hold a guitar (without impacting posture and body in general). The video is mainly aimed for classic guitar players, but it helps you understand what’s a “healthy” way to hold a guitar. Recommended for reading: Top 7 Guitar Posture Mistakes. What Is The Best Age For A Child To Learn The Guitar? Younger children have the ability to learn things faster. Although it varies from child to child, young children may be quick to follow, but they do have short attention spans which means that they lose what they learn just as quickly as they pick up on it. This problem can be solved by constant practice and revision of what you want your child to learn. Children as young as 4 years old can start guitar lessons, although the experiences varies form child-to-child and also depends greatly on the teaching method. Some children start at the age of 5-6 years old. At 7 years old, the child is much more sensible and capable of retaining what he or she is taught. Starting at a fairly younger age is much better than taking beginners lessons during teenage, because by then the child will be equipped with the basic knowledge of the instrument and be able to master it sooner. It really depends on how motivated and patient the child is with the learning process, and also how devoted the teacher is. For a child to learn how to play the guitar successfully at a young age, you need to invest in a small sized, good quality, long lasting guitar. This investment will make creating some fine-sounding chords really easy and great fun. When they realize that they are capable of playing their own tunes, it’ll motivate them to learn further. Often parents can be too forceful while teaching their child something they wish for them to learn and develop taste for. Music can be one of the most fun things to learn, and it is actually an extra-curricular activity that promotes creativity and originality in a child. Guitar lessons should not be something that a young child dreads. Make sure that this activity stays fun and does not become a burden on the child such that they begin to dislike. This is key to increasing your child’s learning abilities. Some online applications and websites can be very helpful when it comes to assisting your child in learning. These can actually make the learning experience much easier if monitored by a parent, because your child can take music lessons within the house, in his or her own comfort zone. Children develop a taste for and become accustomed to what they see around them. If you play the guitar, let your kids sing along and strum with you, it encourages them to learn very naturally. What Size Is The Best For A Kid? Finding the perfect size guitar for your child is crucial for an easy learning experience. Highly enthusiastic children may wish to for a bigger guitar, because it might make them feel more mature and they may identify with it. Although generally you do not want to choose a full size guitar. They are just too big and not comfortable to play even for adults. As I have mentioned earlier, full size guitars have deeper and louder sound. Hearing a kid practice loudly may cause you headaches (even if your child is good). Having to raise your arms above your shoulders to reach over your guitar can be extremely uncomfortable and pull your muscles leading to strain and pain, making it difficult to move your fingers easily across the fingerboard. I recommend buying 3/4 or 1/2 size models. Check out our Best classical guitars for the money buyer’s guide. Generally, classical models are great as the first guitar for a child and they have a warm, mellow sound (which is good for you).